here’s the sample i knit. which can be a mixture of handspun, my hand dyed lamb’s pride or regular lamb’s pride (85% wool/15% mohair), and my hand dyed lanaloft or regular lanaloft. 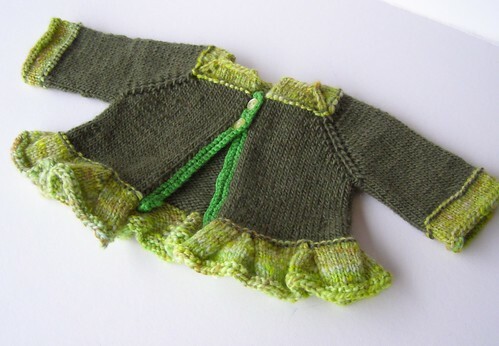 this green belle has lamb’s pride as the main color, my handspun as the accent color. as you can see, i do like some non-traditional baby colors. brights! darks! whatever suits the fancy. the kits will vary dramatically. now i’m thinking i should finish the pattern for the boy belle – started at the same time and similar in shape, but a bit more unisex. 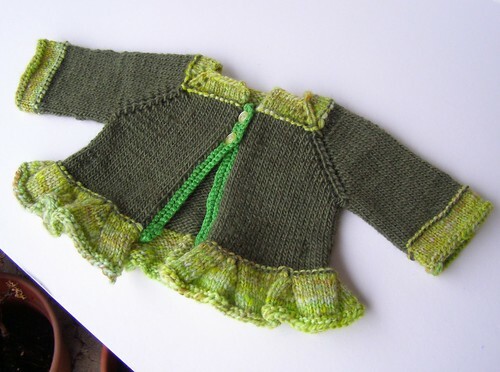 This entry was posted in baby, cosyknitsliterally, cosyspins, handspun, kits, knitting, patterns, spinning, sweaters by cosymakes. Bookmark the permalink. I am going to go through your book and make everything in it with my interpretation on it. I will be posting pics on my blog. I am just starting so it will take a while to get much on there. Hope you come on over and check things out in the near future. wow! i really look forward to seeing what you make.